University students present findings at a congressional briefing in Washington, D.C.
Five criminal justice majors at the University of Scranton, all considering careers in traditional police work or criminal analysis for a police department, have helped the Scranton Police Department (SPD) take a bite out of crime. 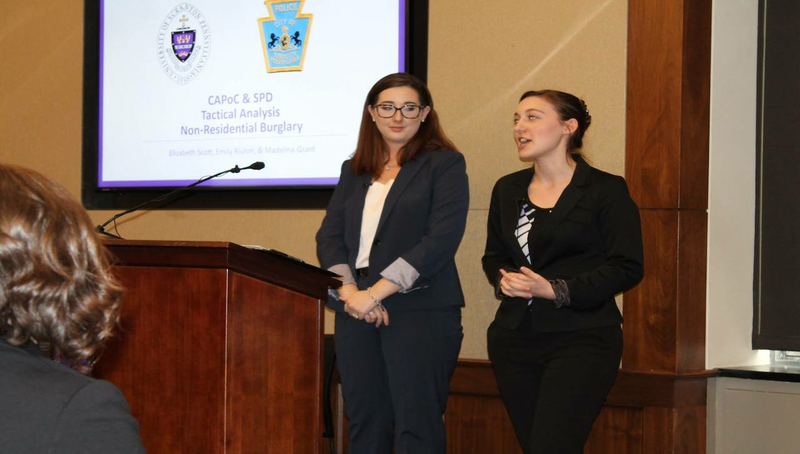 On May 8, the students, who worked on the project through the University’s Center for the Analysis and Prevention of Crime, presented an analysis they completed on burglaries in Scranton at a congressional briefing in Washington, D.C. The Capitol Hill briefing was held in collaboration with New American Colleges and Universities and was hosted by The University of Scranton’s House Representative Matt Cartwright. 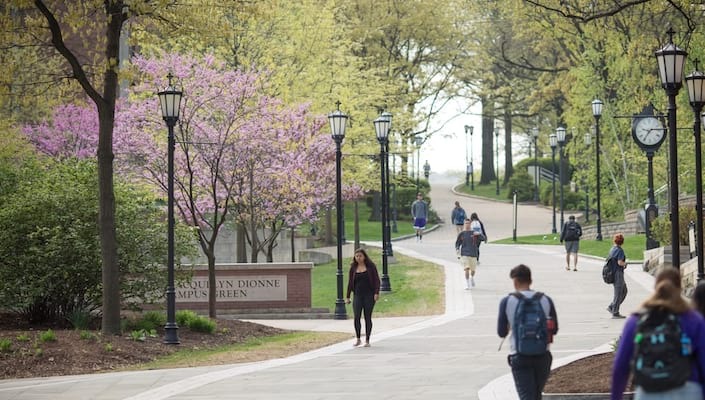 The briefing highlighted an example of how a University can work together with a local law enforcement agency to improve safety and criminal justice practices. Working in conjunction with the SPD, students analyzed nearly 150 incidents between June and November 2017. They identified 33 burglaries with similar characteristics; mainly from non-residential addresses. From police reports, the students created an interactive database including such variables as location, time, modus operandi, and target. They identified three possible patterns; a cluster of five burglaries targeting high-value properties around midnight on Tuesdays in the north of Scranton, another cluster of five burglaries targeting eateries mostly over weekend in another area, and a third cluster of convenience store burglaries in the southwest. Based on the theories of crime science, the findings implied the same person(s) might have committed those seemingly different crimes. The students compared 2017 data with burglary reports between December 2017 and March 2018, and found the same patterns in two of the areas. So they drafted a bulletin calling attention to these patterns in non-residential burglaries that the SPD could share with local businesses. The SPD found it helpful that students were able to narrow down the modus operandi, timing, and geographic concentrations of the commercial burglary problem, with what SPD thought was a limited amount of data to work from. In another project, students evaluated changes in the attitudes and skills of first responders and other criminal justice personnel who had received crisis intervention team training. The training offers de-escalation skills, education in community resources, and engagement with mentally ill persons. The goal is to help responders feel more confident in their ability to handle situations involving persons with a mental crisis. The student evaluation showed that participants were more comfortable and assured dealing with people in crisis. The Congressional briefing was attended by more than 35 staff from Capitol Hill offices as well as education and criminal justice policy advocates. Read more from the New American Colleges & Universities here. University of Scranton students participating in the congressional briefing were Emily Bluhm, a junior from Plymouth Meeting; Madeline Grant, a sophomore from Dallas; Caroline Landon, a junior from Pompton Plains, New Jersey; Elizabeth Scott, a senior from Avondale; and John Sember, a junior from Sparta, New Jersey. Also attending were Michael Jenkins, Ph.D., Associate Professor of Sociology, Criminal Justice, and Criminology and Executive Director for the Center, Ismail Onat, Ph.D., Assistant Professor of Sociology, Criminal Justice and Criminology and Chief Analyst for the Center; Julie Cohen, Director of Community and Government Relations at the University; and Scranton Police Chief Carl Graziano.